Our range of products include power steel t bolt clamp, ss high torque t bolt clamp, spring loaded t bolt clamps, t bolt clamps for automotive industry, t bolt spring loaded camp and t bolt hose clamps. 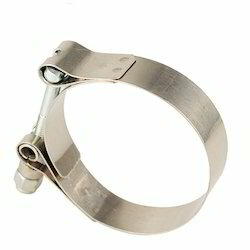 We are offering Power Steel T Bolt Clamp to our customers. 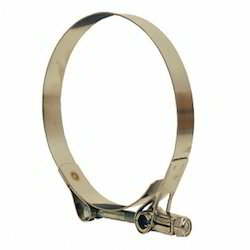 It has the special feature of lock which gives easability to lock and unlock the hose when needed, we made customised hose lock clamp and deliver the same. 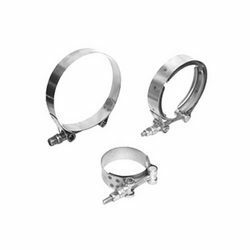 We are the leading manufacturers and suppliers of SS High Torque T Bolt Clamp which can be majorly categorized into T Bolt Hose Clamps. Spring Loaded T Bolt Clamps provides the self-compensating (constant tension) feature that prevents the development of leak paths due to temperature fluctuations. 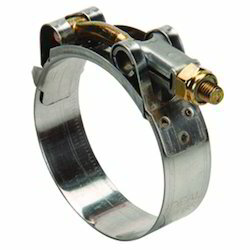 T-Bolt clamps provide heavy duty, uniform sealing pressure for a positive, reliable seal. 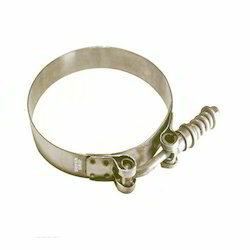 These stainless steel Spring Clamps can be customized as per the specification of the client. T Bolt Clamps for Automotive Industry are used in Automotive Industry. The T-Bolt Clamps are attached with a circular arc which can be adjusted accordingly. These T-Bolt Clamps Without Springs are available in Stainless Steel Type 304/202 and can be customized according to the requirement.